Reuters: Premier League leaders Liverpool recovered from a poor first-half display as they came from behind to beat an impressive Crystal Palace 4-3 in an enthralling clash at Anfield on Saturday. The win, secured by late goals from Mohamed Salah and Sadio Mane, moves Juergen Klopp’s side a provisional seven points clear of second-placed Manchester City. “The result is massive, we have 60 points now, it’s crazy, it’s an important number,” said Klopp. Liverpool equalised 47 seconds after the interval when the ball looped high into the area where Salah skilfully converted with the outside of his left foot after Virgil van Dijk’s long-range effort was blocked. Suddenly Liverpool were buzzing and it was no surprise when Brazilian Roberto Firmino put them ahead, collecting a pass from Naby Keita and beating veteran Palace keeper Julian Speroni with a slightly deflected low shot.But the visitors were not about to roll over and they fought back to level at 2-2 in the 65th when James Tomkins was left unattended to head in a Luka Milivojevic corner. 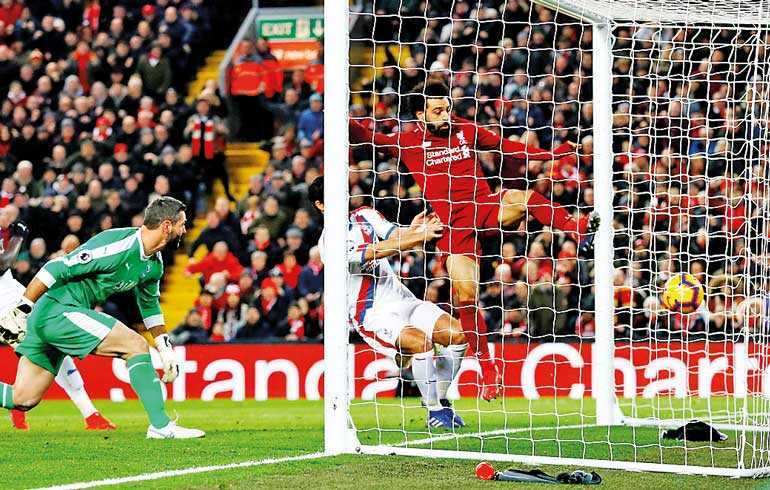 Speroni, Palace’s 39-year-old third-choice, then gifted Liverpool a goal when his one-handed waft at a harmless-looking James Milner cross fell for Salah to tap in after 75 minutes.Salah now has 50 goals in his 72 Premier League appearances and is the current top scorer in the league with 16.Milner was sent off in the 89th for a second yellow card after a late challenge on Zaha before Mane added the fourth for the hosts with a solo strike in stoppage time. There was still time for Palace to strike again with Max Meyer beating Alisson Becker with a low shot which the Brazilian keeper would have expected to save.Liverpool’s back line then handled some late pressure from Palace to seal the three points. “It’s a massive relief,” said Klopp. “We knew for different reasons the game would be difficult. Crystal Palace traditionally do well against Liverpool and with the physicality it was clear it would be like the first half was. “We had to stay positive, being one down is not a massive blow, we just needed to win the second half and did what we had to do,” he added.